Youth, fish and smiles in MN. There is nothing better than the smile on a kid while they are holding up their prize catch. We encourage you to take a kid fishing in Minnesota. Take a picture of their catch and let us post it here. They don't have to be trophy fish, trophy smiles are what it's all about. Dana Larson of Nevis, Minnesota with her late season bass caught (and released) on Belle Taine Lake. 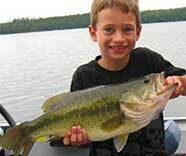 Isaac Kern caught this six pound largemouth bass the morning of August 3 on Crow Wing Lake in Minnesota. The fish measured 22 inches in length. He caught his monster on a kids Shamu rod with a floating frog. Post MN, kids fishing pictures. 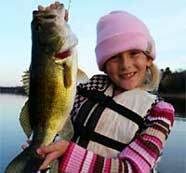 If you have photos of proud kids and their prized fish they caught in Minnesota, please submit them for posting here. Youth fishing pictures in Minnesota.